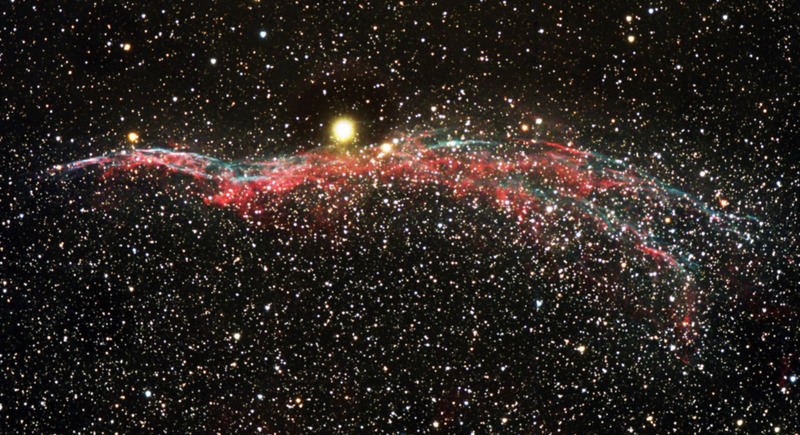 The Veil Nebula is a fairly large complex which is often broken up into three images because the whole field is so wide. 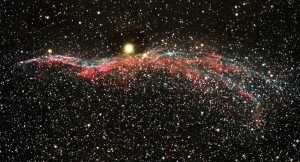 My favorite part of the veil is NGC 6960, the “Witch’s Broom”. Nearly one year ago I spent two days imaging and wasn’t particularly satisfied with the results. But, it’s been a year, and I’ve learned a lot. So I decided to change it up a bit. The challenge of processing this cackling denizen of the sky is 52 Cygni, which can quickly flare up into a giant fireball killing the middle of the nebula. Photoshop offers so many tools to help combat this and keep it under control – such as selective leveling, and feathering selections. Using layer masks to process awkward selections also helps to highlight the nebula, and keep this star’s brightness at bay. That said, it certainly makes this one fun to process! Several masks were used here including unsharpen mask, gaussian blurs, and a high pass filter. The healing brush tool was used aggressively to try and pull out a bad column — if you look closely, can you see where that defect is? This entry was posted by admin on June 26, 2011 at 3:24 pm, and is filed under Nebulas. Follow any responses to this post through RSS 2.0.You can skip to the end and leave a response. Pinging is currently not allowed.